of course I could not let that Twofer challenge go by and I din't even wait until the last moment. The theme was too good - BIRDS - one of my favorite stamps to buy! I can never say no to bird stamps... Do you have certain types of stamps you simply have to have, despite already owning lots of them? Or am I the only one out there???? 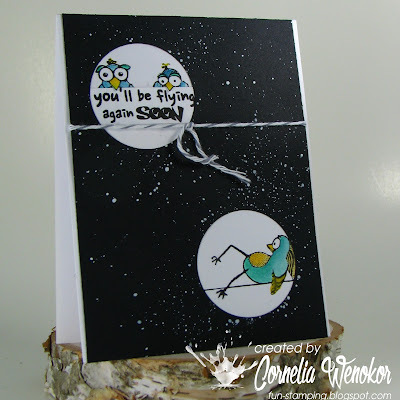 I used this super long bird stamp from Carabelle Studio - it is the cutest thing ever! I stamped it diagonally onto card #1 and colored it with Inktense. The second card did not get a lot of coloring - I was colored out at this point, ha ha.... It received a bit of masking. It was a bit fiddly to make it all work - a couple of tries to get the round die cut opening the correct size and how to squeeze in the sentiment under the bird beaks, etc. Livened it up with generous splatters and a little piece of Bakers twine. I am so happy with the result. I always find the second card more difficult and often I am not totally happy with it, but here I am! Oh my goodness, what a fun card! Those birds are adorable and your layout is perfect! Thanks for joining us at Watercooler Wednesday! WOWOWOWOWOWOWOW! You, most certainly, nailed the Twofer challenge. Once again, I see a win in your future. OUTSTANDING coloring and design on both card. Love these birds. 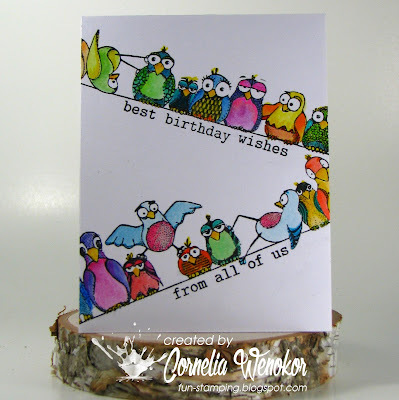 Cornelia... so love your bird-day card! So much fun! Terrific cards, Cornelia! 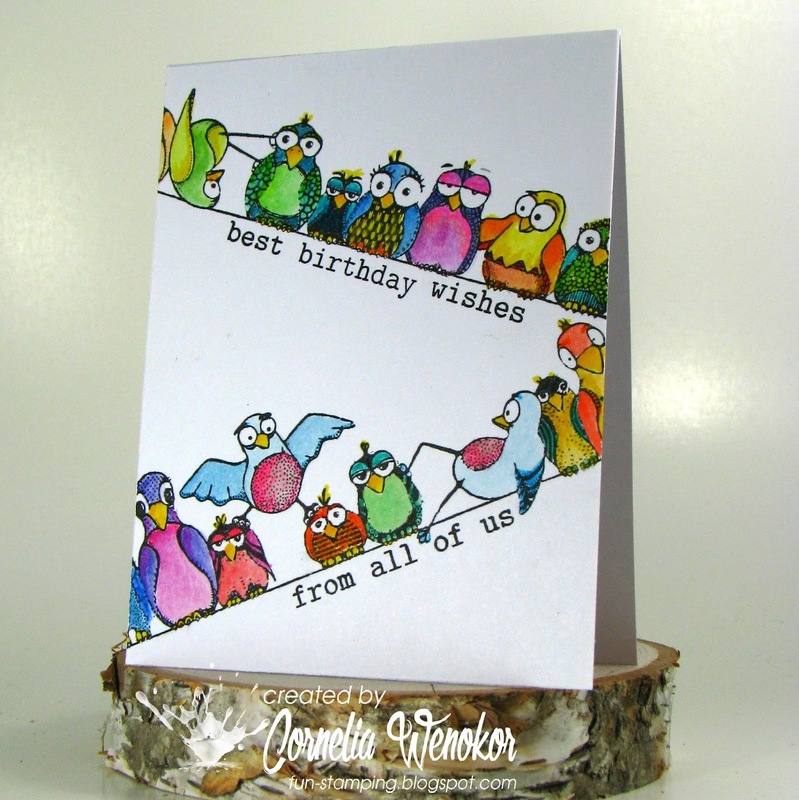 I especially love your birthday greetings with all those wonderfully coloured birds stamped onto the card on angles. The end result is a totally unique and fun birthday card. Great work! Thanks so much for joining our Watercooler Wednesday Challenge this week. I like them both but the second one is my favorite. I am always sending get well cards and this is perfect! I too love bird stamps and have way too many. Also sheep, deer and trees are stamps that I have a hard time not buying. Sometimes my conscience wins and sometimes I have a new stamp to play with! I always look forward to your Katzelkraft cards too and have begun buying them too. Oh, my gosh, those birds are hilarious! I love, LOVE your first card with the birds all lined up, the angles, the placement of the sentiments. Lots of coloring and so beautifully done. It's a CAS card that isn't so CAS in the making, but worth every minute of it. #2 is always the hardest for me, too, but just look how you pulled it off! Excellent masking, great design. The black really makes the coloring pop. Bird stamps are my weakness, especially the whimsical one that you can color any which way you choose. 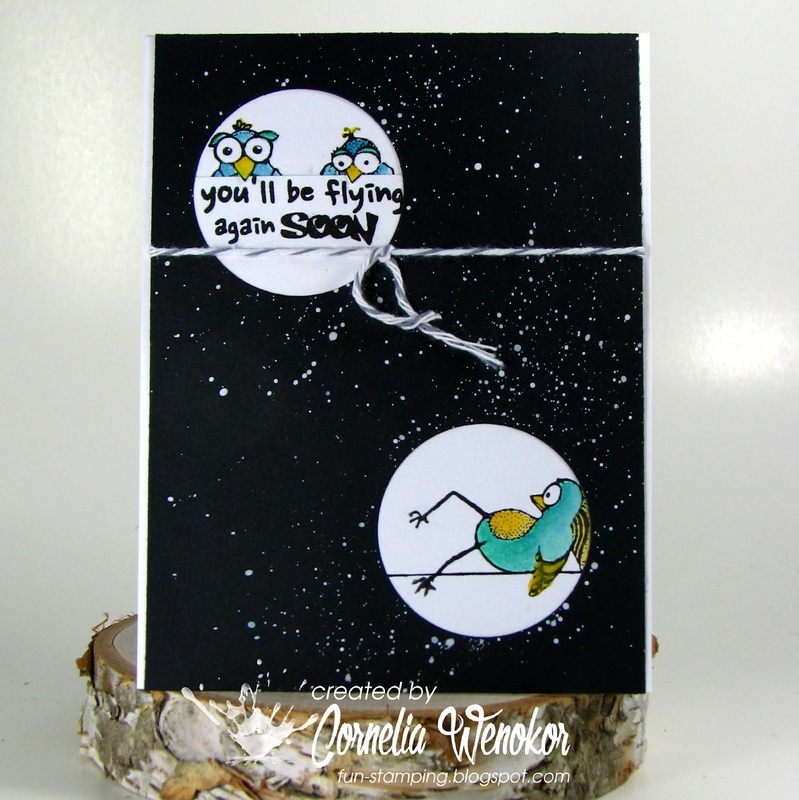 Thanks so much for playing along in our Twofer Challenge, Cornelia. This was a treat! Wow! These are both wonderful and so fun too! I think you have done an outstanding job and I predict you a winner with these. I know what you mean about choosing colors, Cornelia, but yours worked out wonderfully. Love the one lying down on the get well card. Wieder einmal sind Dir zwei herrlich schräge Karten gelungen!!! Super!! These are just too darn cute and so much fun! Cornelia, Saw these two tweet cards in the Twofer Gallery and just had to stop by. These are absolutely adorable, and I love the two sentiments Great job!!! That is the cutest stamp...I don't remember seeing that one before...Great job using it for your cards! 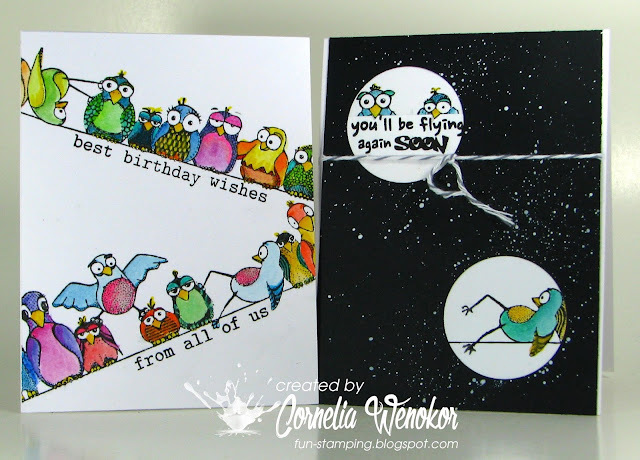 Cornelia, what a funny bird stamp set! 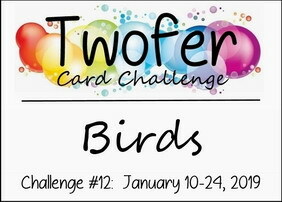 Love both of your cards for the Twofer Challenge! Great use of those adorable birds! Love the eclectic grouping of birds in the first and spotlighting of the second! Congratulations on your honorable mention at the Two-fer Challenge, Cornelia. Knew that the uniqueness of your Twofer would be a winner. So many congrats to you.